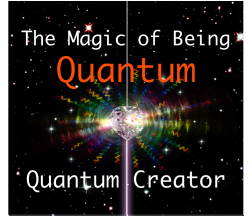 The Magic of Being ﻿﻿﻿﻿﻿﻿Quantum﻿﻿ ﻿﻿﻿﻿﻿﻿﻿﻿﻿﻿﻿﻿﻿﻿series. With Quantum Creator we find out how to experience our full creative potential. We have explored how to access our Quantum Pulse, then connect ourselves into the Quantum Network, Harmonise with our unique divine frequencies and then share that with others. Then we connected to our Quantum Essence to really understand what it is we have been called to do now that we are living and breathing this new energy. As we explore Quantum Creator we will discover how we co-create our reality now that we are ‘at one will all’. Each of us is a unique expression of the one life force yet we do not operate alone; we coexist with others on this planet and need to come to a consensus as to how we would like to see the world develop (and the world herself might want to influence the outcome!). I have found thinking from the heart quite a different experience than thinking from the mind. Moving our awareness from the head to the heart and then feeling out to see what moves us to take action is an entirely new skill we need to learn, and the only way to do this is to practice. Some people have a really good relationship with their intuitive selves and this is an excellent place to start, however we can all learn to fine-tune our skills to think in this entirely new way. So the first step is to feel into our heart and find that infinite loving presence of our divine essence. With Quantum Essence we were finding out how to channel our divine essence and how that then translated into what we came to do with this life. Quantum Creator now takes us into the realm of co-creation, how does our wonderful gift manifest in a brand new world, what does this world look like, how do we behave and interact with each other and our planet, how did we make this happen? In a recent course The Masters of the Genius Universe with Soleira and Santari Green we explored our Genius potential which took us to new heights of not just self awareness but also of our mutual creative potential (particularly when we each bring our unique talent through from our divine selves). I’d like to share with you something I wrote during an exercise to connect to our God selves (this is what I’m calling our Quantum Essence), this will help with the next exercise we do together. When I connect to the source, to God, I often find it useful to keep changing my perspective, to enhance the experience and to merge more fully with the/my divine mind. Initially I sense out and find God way out there, that place just beyond infinity; not one place, more like all places. The supreme intelligence then makes itself known as a flow, as a feeling of limitless and unconditional love, all I need to do is flow into it. My body blisses out on this energy, every cell beginning to burst with light and love. Next I move my attention to be God, looking out from the infinite, pleased with what I see, I stretch out in all directions. Then I become God looking out of a human form (me) here in my body, I shift my attention from out there to in here, but in here I’m now God as Colin. So I did that and then listened…. ‘Beloved you breathe my energy so easily now, we are one so readily, you are sparkling in your own brilliance (as you say on your website). This is the voice we will use, the source of the words, to write your story, to share the experience with others. Imbue the words with the energy we have become, gently sustain the loving flow as you write. I will be here to guide you, just listen carefully’. There was more but I wanted to share the energy of that moment, because the words are just one aspect of what is fundamentally a connection to your divine essence. Each time we create from this full and whole part of ourselves we bring forth the power and clarity of our soulful expression, which includes the energy that ultimately creates our reality. We may hear words, feel an emotion, see colours or shapes, hear sounds or maybe all of those things, and it is from these that we shape our reality. When we are Quantum Creators we accept the responsibility of creating all that we see, all that we are. We do not blame others for things that happen to us because we know that we created them for our own edification, to experience them here on Earth. The most powerful way to create is with others, with like minded people who meet specifically to achieve something, often not knowing exactly why they are meeting or what the specific outcome will be. Following your knowing is a particular aspect of Quantum Creator that can seem quite difficult at first but when practiced with others we see that it is something we need to develop together. When I first contacted Laura Pocket and Hilary Carter about us doing something for this year’s spring equinox we did not know what it would be specifically, just that something had called us to connect. I had been learning from Hilary about how she follows numbers and it was while I was reviewing her book Number Woman and was thinking of where she might be (she travels extensively) that I saw 11:11 on my clock and I knew I had to contact her. She then suggested we contact Laura and between us and a few Skype calls we settled on a place and a time, and the outline of a ceremony. It was only on the day that the final format of the celebration crystalized between us, and even during the ceremony it changed as we were guided in each moment. When we allow our divine guidance to lead us it can be a very dynamic experience, and much of how we have operated in the past needs to be revised or reshaped. When I was setting up my new website I was using a process more aligned to businesses; define, design, build, test and go live. I found myself doing all the right things but without shaping the product first. I designed a blog, a shop-front, tested the shopping cart and processes, all worked fine except I had yet to create a product. What I really needed to do was find out what it was that wanted to be expressed, then work our what I needed on the website. Instead of which I went straight in with the head based work methods which to be fair did provide the basis for my current website, but there was one basic thing missing – what was it that I would be unleashing that would express my new energy flow, my divine essence? I missed my first go-live deadline because I had not quite aligned myself with my Quantum Essence; the Quantum Creator had yet to emerge. Only when I shared my dream with others, explained what it was I was trying to do, did they come up with idea of piloting a teleseminar series – create a course with you rather than for you. Why not find out what your own Quantum Creator would like to express? What is it that fires you to take action? Will you take a Quantum Leap in your life?